"Christopher Dresser designs are stylish and highly original. His Old Hall pottery designs are some of the best examples of Dresser's identified design work for the Staffordshire potters. 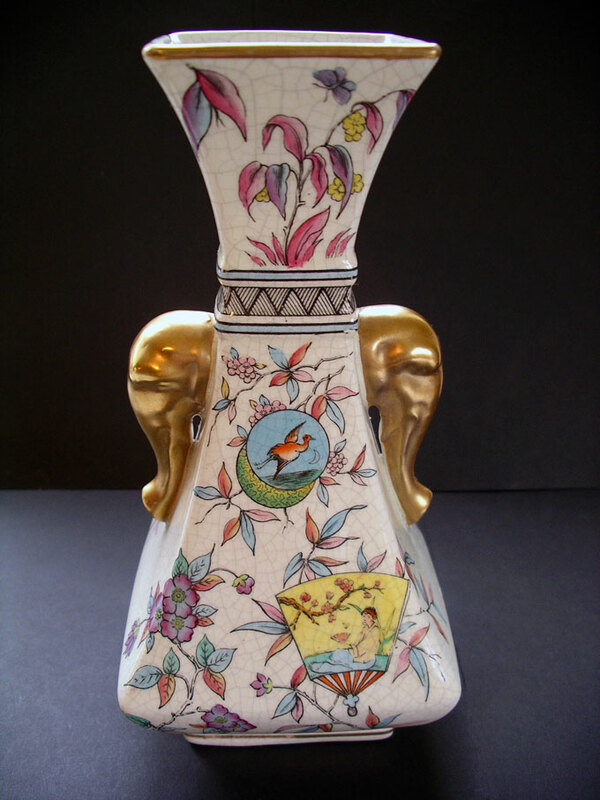 This very attractive and collectable Aesthetic Old Hall earthenware vase illustrates Dresser style at work in both the shape of the vase - with the extravagant elephant head handles and in decoration with distinctive Japanese influenced Aesthetic style pattern motifs. 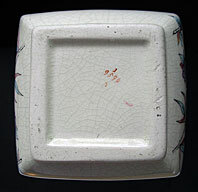 An important design that epitomises the best of English Staffordshire Victorian art pottery. " Antiques Expert Hamilton Bear. References: An identical vase is illustrated in C.W Dresser People's Designer 1834-1904, H. Lyons & C. Morley 1999, catalogue No. C-188. 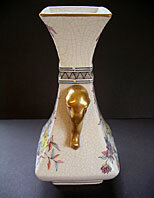 The catalogue vase is priced at (1999) £500 GBP for a pair. Dimensions: width 115 mm max., height 235 mm max. Condition: In very good display condition. There are no chips, breaks, missing pieces or restoration. 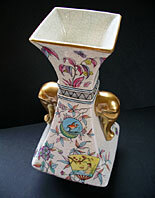 There is a fine network of crazing to the glaze of the vase as is often found on Old Hall earthenware vases. A few traces of rubbing wear to the painted black line border and gold line to base that do not detract from the overall decoration and decorative qualities.